In Scripture, we are encouraged to “pray without ceasing.” The whole Christian life is enveloped in prayer, both as individuals and with others. 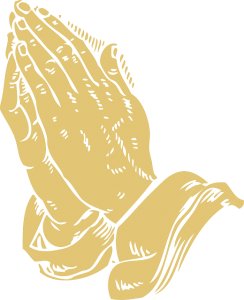 When joining with a community of people to pray, whether in a formal worship setting, at a retreat, before a meeting or in a hospital room, our heritage has provided a treasure chest of resources from which we can draw to shape our communal prayer. To have someone added to our prayer chain please call the church office at 570-752-3737. Mary Hoida; Becky Hosler; Emma Shaffer; Vicki Shaffer; Louis A. Moser; ; Lindsay; Pastor Bernie and Elaine Englehardt; Jerry Birt; Shirley Francis; Crystal Canouse; Kathy Fetterman; Robert Barchik; Bonnie Fausnaught; Sarah; Kristian; Fred; Ryan Frey; Bobby Dorsey and family; Frank Diehl; Bill Slowick; Jim Tate; Joanne Brown; Dave Kurapatski; Kathy; Randy Albertson; Warren Baughman; Phyllis; Bill Barbara Charles; Jim Crouse; Charles East Jr; Sue Ellen Miller; Peyton; Andrew; Matthew; Ella; Elaina; Jane Stine; Susan Rosand; Pat Evina; Jeanne Hoida; Johanna Stanley; Sally Campbell; Alex Terry; David Saracino; Lindsey; Megan Wark; Matt Samson; Len Swida; Bill; Sandy Campbell; Wayne Difebo; Robin Mccormick; Matt; Joan Karns; Chick; Josh; Amber; Peyton; Andrew; Deborah Yohe; Lindsay; John Vassello; Gary Cragle; Margo Swan; Tim Wentzel; Sandy; Shirley East; Sandy Pierce, Steven Kulp; Andy Bieber; Harold Beck II; Chad Jacoby; Sterling (Sonny) Stout; Luke M; David Saracinol Cammeron Mallay; Helen and Audra; Paul Trioni; Kennedy Reed; Wendi B; Tanya S; the Humphrey family; the Denny Lowery family; the family of Connie Stevens.